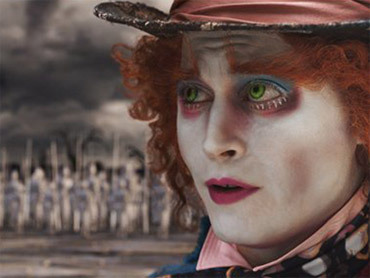 Johnny Depp and Tim Burton's "Alice in Wonderland" easily remained the No. 1 weekend draw with $62 million, according to studio estimates Sunday. The Disney fantasy has climbed to a $208.6 million total domestically, becoming the first $200 million hit released this year. In its second weekend in theaters, "Alice in Wonderland" pulled ahead of the $206.5 million domestic haul of "Charlie and the Chocolate Factory" to become the top-grossing of Depp and Burton's seven films together, which include "Edward Scissorhands," "Sweeney Todd" and "Corpse Bride." "I believe it's literally the magical, if you would, pairing of Tim and Johnny," said Chuck Viane, head of distribution for Disney. "When you take those two, they always seem to make something really out of the ordinary." "Alice in Wonderland" added $76 million overseas to bring its international total to $221 million and its worldwide gross to $430 million. A rush of new movies had so-so openings, led by Matt Damon's Iraq War thriller "Green Zone," which debuted at No. 2 with $14.5 million domestically. Released by Universal, "Green Zone" stars Damon as the leader of a U.S. Army team who stumbles onto a conspiracy over the search for weapons of mass destruction in Iraq. Paramount's romantic comedy "She's Out of My League" debuted at No. 3 with $9.6 million. The movie stars Jay Baruchel as a geek in an unlikely romance with a babe. "Twilight" star Robert Pattinson's romantic drama "Remember Me" opened at No. 4 with $8.3 million. The Summit Entertainment release stars Pattinson and "Lost" co-star Emilie de Ravin in a dark story of young lovers with tragedy in their past. In its fourth weekend, Paramount's "Shutter Island," the latest collaboration between Leonardo DiCaprio and Martin Scorsese, was No. 5 with $8.1 million, raising its domestic total to $108 million. Debuting at No. 6 with $7.6 million was Fox Searchlight's comedy "Our Family Wedding," starring America Ferrera of "Ugly Betty" as a Hispanic bride marrying a black man. "Alice in Wonderland" took in nearly as much as the rest of the top-10 movies combined. "It's like this great divide between the No. 1 and 2 films, which says that without `Alice in Wonderland' in the marketplace, we'd be hurting right now," said Paul Dergarabedian, box-office analyst for Hollywood.com. "By itself, it's really propelling huge box office." Hollywood's business soared, with overall revenues at $144 million, up 43 percent from the same weekend last year, when "Race to Witch Mountain" led with a $24.4 million debut. Factoring in higher admission prices, movie attendance this year is running 6.7 percent ahead of 2009's, according to Hollywood.com. Before "Alice in Wonderland" opened, attendance was lagging slightly behind last year's. "In just a couple of weeks, `Alice' has turned the entire marketplace around almost single-handedly," Dergarabedian said. James Cameron's science-fiction sensation "Avatar" remained a strong draw after nearly three months in theaters, taking in $6.6 million to raise its domestic total to $730.3 million. The 20th Century Fox release has topped $2.6 billion worldwide. Summit Entertainment's "The Hurt Locker," which beat "Avatar" for best picture at the Academy Awards, got a slight box-office bump from its Oscar triumph. The Iraq War drama, which is out on DVD but came back to theaters for Oscar season, pulled in $828,000, raising its box-office total to $15.7 million. 1. "Alice in Wonderland," $62 million. 2. "Green Zone," $14.5 million. 3. "She's Out of My League," $9.6 million. 4. "Remember Me," $8.3 million. 5. "Shutter Island," $8.1 million. 6. "Our Family Wedding," $7.6 million. 8. "Brooklyn's Finest," $4.3 million. 9. "Cop Out," $4.2 million. 10. "The Crazies," $3.7 million.